Home / Articles / Batch Cocktails the Right Way! Pouring drinks is a piece of cake. Mixing basic cocktails is a cinch. Well balanced cocktails is somewhat difficult. 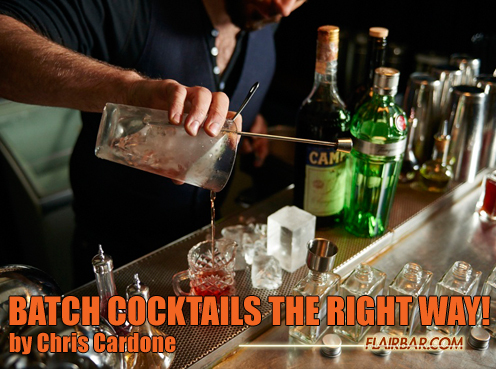 But the truth is, making drinks is definitely a part of bartending that is really not that difficult. Being a great bartender has very little to do with making drinks. However, executing well balanced cocktails in a restaurant that does 250 covers per night, in which the cocktail menu items sales are around 22% of the nights total sales…….now that can get hairy, to say the least. So batching cocktails can definitely help with speed and efficiency. However, batching entire cocktails is a gamble. What happens if you don’t sell the whole batch in 48 hrs and the batch contains citrus juice? Do you dump out all that product down the drain? I hope not, for the owner’s sake! Private events, with a relatively predictable guest count with a set amount of product, sure…batch away. But when you have to worry about your liquor costs, perhaps batching entire cocktails might not be the best plan. So the simple solution that works at my restaurant is to batch only the spirit portion of the cocktail. I am certainly not the creator of this idea and there are multiple restaurants I’ve been lucky enough to work in, that have taught me this speed saver. Spirits, (exceptions are wine based ingredients; Port, Sherry, Madeira, etc) have a very long shelf life and have no negative impact on being batched with other spirits. But it certainly saves some valuable seconds over the course of a night when you can pick up one bottle instead of 3 or 4. Batching is not very complicated once you get the hang of it. Start by using 1 liter bottles, which hold 33 fluid ounces. Then divide that number by the total fluid ounces of the cocktail’s spirit combination. This will give you the total amount of possible drinks you can store in that bottle. A very easy example is a negroni batch using a 1.1.1 ratio. So, if I use three liquors at 1 oz each, the total amount of spirit is 3oz. Take the 33oz bottle, divide by 3 oz and you get 11 negronis. Then you take that number and multiple it by the amount of each ingredient. So, 11 drinks multiplied by 1oz of gin equals 11 oz of gin. Repeat that step for the Campari and vermouth. Batch complete. Measure out 11 oz of each ingredient into 1 bottle and you have 11 negronis waiting to be poured. Then, upon order, simply pour 3oz into your mixing glass, stir and strain. Garnish. Done. You can use that formula for any cocktail you want to batch. You can also make it a little easier for yourself and you can start using bottles from the 86 co. if you’re lucky enough to work in a market they are distributed in. (Hint: Aylesbury Duck Vodka labels come off the easiest). Their bottles are marked on the side to help for batching and inventory purposes. Life made just a little easier. Thanks boys. I currently run a bar program with 9 cocktails, which are all batched. Over the night, if I make 100 cocktails from my menu, I probably have picked up 100-300 less bottles that night. So, when you’re liquor rep complains that you’re not showcasing their bottle with the label out….you can tell them that the menu placement, back bar placement and time saved allows you to not only give them brand recognition (on the menu and the back bar), it helps you make more cocktails throughout the night, month, year. Which means you sell and order more product. Everyone wins.